SALZBURG — The gimmicky proposition of Mozart’s Requiem enhanced with equine ballet dominated this year’s Mozartwoche schedule, and no doubt budget. 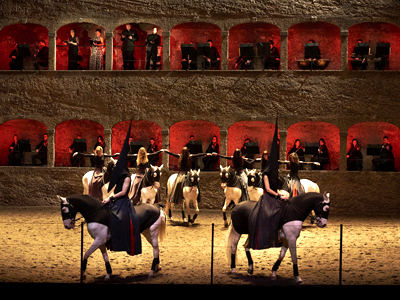 It capped, in a way, five iterations of the festival lavishly managed by Marc Minkowski and his front-office counterpart Matthias Schulz, and it brought in for the second time the French conductor’s compatriot Clément Marty, called “Bartabas,” to choreograph the horses and riders of his Académie Équestre Nationale du Domaine de Versailles. Conventional fare for 2017 included the Vienna Philharmonic in three programs, concerts by five other orchestras, and much chamber music. Minkowski kept the Mass tempos brisk Jan. 29, and textures fairly clear given the stashing of all voices and instruments in the Felsenreitschule’s arrayed stone arches. The vocal quartet (Genia Kühmeier, Elisabeth Kulman, Peter Sonn, Charles Dekeyser) and the Salzburger Bachchor sang with poised radiance; Les Musiciens du Louvre, unable to hear each other normally, appeared keenly attentive to Minkowski’s distant signals, but their instruments did not fully project. Eight blue-eyed, cream-coated Lusitanos, new to Austria, trotted, walked or stepped in calm, tidy formations through most of the score. Brief sudden flurries punctuated this tame pageant when the composer seemed to prompt, for instance for the Confutatis, and Bartabas’ own “Soutine,” a black stallion, effected a silent spotlit solo roly-poly before the Sanctus, a kind of seventh-inning scratch likely meant for contemplation. But aside from occasional grunts, snorts and ear-flappings (often a tempo), the Académie’s efforts added little in drama or spirituality. Minkowski instructively framed the main work, without ballet. Mozart’s pensive A-Minor Miserere for three voices (1770) established the choral sound unopposed, its alternating verses sung to plainchant. Then came the Symphony from Händel’s Funeral Anthem for Queen Caroline “The Ways of Zion Do Mourn” (1737), whose first chorus lends the theme for the Requiem’s Introito. Afterwards, the familiar Ave verum corpus refocused ears and eyes on Salzburg’s polished choristers. In the Eroica Symphony the previous evening (Jan. 28), Thomas Hengelbrock’s understating of rhythmic accents created irresolute impressions. But the NDR conductor traced the second movement’s deathly promenade in gripping dynamic detail, courtesy of the Vienna Philharmonic strings, and to the Finale he brought weight, drama, and the broadest lyricism, riding confidently on Beethoven’s counterpoint. The Großes Festspielhaus concert began with the overture to Don Giovanni, played vigorously and with considerable power. These qualities carried over to Mozart’s D-Minor Piano Concerto, K466 (1785), suiting Leif Ove Andsnes’ conception of the solo part: lucid, to a degree elegant, not especially charming. Beethoven’s cadenza in the first movement sounded splendid yet out of place; Andsnes opted for Hummel’s in the third movement, concise and less Romantic. There were occasional problems in the horns and trumpets. Cappella Andrea Barca, regular guest of Mozartwoche, upheld its sterling reputation in a generous Mozarteum matinée Jan. 29, captained from memory by András Schiff. The Prague Symphony (1786) emerged in deep, neatly distinguished colors, product of a light string body resonating low on the hall’s cozy platform, with violins divided and a bass on either side. Beguiling flute, oboe and bassoon work did the composer proud; rhythms were pointed smartly. Haydn’s Clock Symphony (1794), after the break, traded elegance and humor as required. Cellos anchored the Cappella’s consistently handsome sound. Schiff opened and closed the program playing concertos on a modern Bösendorfer: a witty account of Haydn’s D-Major Piano Concerto (1780), its contours inflated and flattered by the warm acoustics; and a gracefully phrased Piano Concerto in A Major, K488 (1786), indeterminate in mood, but with its illusive logic held together convincingly across all three movements. Bravissimo. This entry was posted on Friday, February 24th, 2017 at 1:44 pm	and is filed under Munich Times. You can follow any responses to this entry through the RSS 2.0 feed. Both comments and pings are currently closed.